EDMONTON - Prime Minister Justin Trudeau is pouring cold water on Alberta's suggestion that the federal government use legislation or a court appeal to get construction started quickly on the Trans Mountain pipeline expansion. 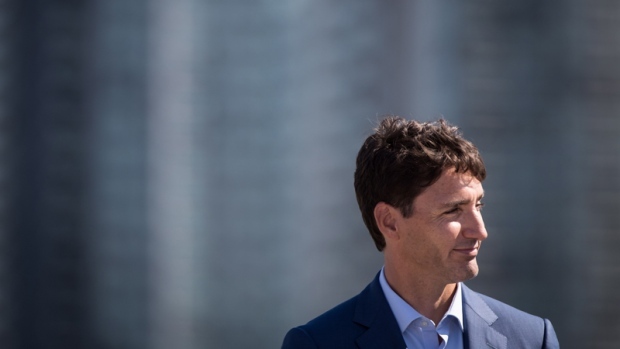 In an interview on Edmonton radio station CHED, Trudeau says using “tricks” such as a new law or the Constitution's notwithstanding clause would create further legal fights down the road. “Using a legislative trick might be satisfying in the short term, but it would set up fights and uncertainty for investors over the coming years on any other project, because you can't have a government keep invoking those sorts of things on every given project,” he told the radio station Wednesday. The prime minister was in Edmonton on Wednesday and met in the afternoon to discuss the pipeline with Premier Rachel Notley, who has pulled her government from the national climate plan until there's a fix. “We know Albertans were disappointed, as were many Canadians, with the (court) decision,” said Trudeau before the meeting at a downtown hotel, with Notley beside him. Notley said she hoped to discuss options with Trudeau. “The Federal Court of Appeal decision, in and of itself, is probably not going to get us there, and so we have to look to other solutions,” said Notley. Speaking at an event west of Edmonton earlier in the day, Notley said timing is everything. “We have people who are wondering whether they should be going to work in the next week or two,” she said. Trudeau downplayed the idea of appealing the decision in the radio interview. “The court was very clear: You need to do more on the environment. You need to do more on consultations, if anything is going to happen, so that's what we are going to do,” he said. But at an event later Wednesday morning Trudeau said an appeal is one of many options under consideration. “We are looking at what an appeal would look like, what it would mean,” he said. Trudeau said the project would be dead had Ottawa not stepped in. He said the government's goal is not to make money but to see the expansion completed.